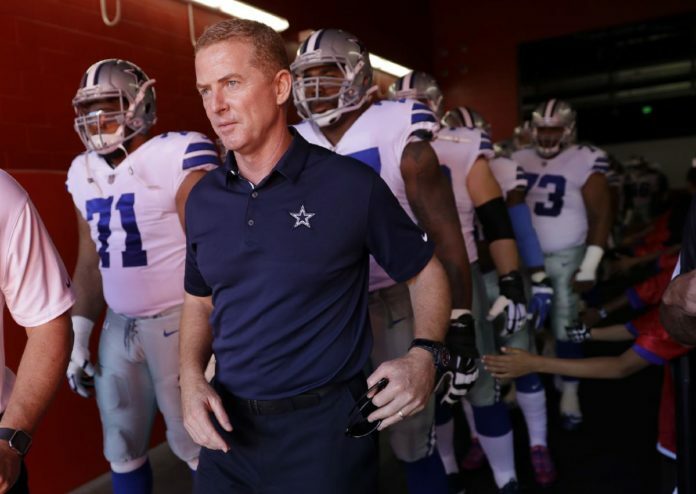 Dallas Cowboys head coach Jason Garrett before an NFL football game against the San Francisco 49ers in Santa Clara, Calif., Sunday, Oct. 22, 2017. In 2005, Sports Illustrated called it the top NFL rivalry of all time and one of the greatest in sports. ESPN ranked it the best rivalry in the NFL. Sportster ranked it the 17th biggest rivalry in the world. The Dallas Cowboys and Washington Redskins have a combined 31 division titles and eight Super Bowl championships. They are the two wealthiest NFL franchises. But this rivalry is about more than just winning and losing important games to each other — it has a unique history of clashing owners, large-scale pranks, impossible comebacks and one-point wins. While many games since the 1960s have fueled the fire into what it is today, the events between these two teams off the field are what truly set this rivalry apart from others in the league. The team names even allude to scenes of classic Hollywood movies and the “Wild West” era, when the cowboy and the Native American would fight each other to the death. The story begins in 1958, when Texas oil tycoon Clint Murchison Jr. tried to buy the Redskins from George Preston Marshall and bring them to Dallas. Marshall changed the terms for the sale at the last minute, which led an outraged Murchison to cancel the deal. Through a close friendship with Washington’s band director, Murchison acquired the rights for the Redskins fight song. When he decided to create his own team in Dallas, all current team owners had to approve, and only Marshall stood in the way. Their negotiation: Marshall approves of Murchison’s team, and Murchison returns the song. The Cowboys were founded in 1960. The next two years saw something called the Cowboy Chicken Club. In December 1961, unknown Cowboys fans found their way into D.C. Stadium with chicken feed and two large crates of chickens — 75 white and one black. The plan was to release the chickens during halftime to symbolize Marshall being the only NFL owner who would not recruit African-American players. The stunt failed, but the Cowboy Chicken Club would strike again. The following year, a large turkey was dropped off in the bathroom of Marshall’s hotel suite. Marshall fled the room after the turkey gobbled at him. Soon after, four banners with “CHICKENS” scrawled across were unfurled at the upper decks of each 50-yard line and each endzone. Acrobats hired by the Cowboy Chicken Club rushed the field in chicken costumes and threw colored eggs. One even released a live chicken. They miraculously evaded the security guards and were never apprehended. Years later, on the final day of the 1979 regular season, the two teams faced off in Dallas for the NFC East title. Days before the game, a funeral wreath arrived at the Cowboys’ practice facility in “sympathy” for their upcoming loss against Washington. When the Cowboys won that game 35-34, defensive end Harvey Martin grabbed the wreath and stormed to the visitor’s locker room, where he tossed it inside. While these are just some of the events that made this rivalry explode into perhaps the biggest in football history, the teams have become more professional over the years, choosing to focus on football. However, the rivalry is not behind them. They will carry this history with them as they prepare for another matchup on Sunday.